Welcome to my comprehensive guide for Mercedes. This guide has everything a Mercedes need to know varying from skill builds to AP distribution to training spots to equipment to medals! We have everything you need to know! If you want to find the skill build for your level, just press control + f and type your level in. It should take you to the skill build. Please do not edit without my permission. Note there are 2 builds for second job and third job. Hyper Skills included in this guide! 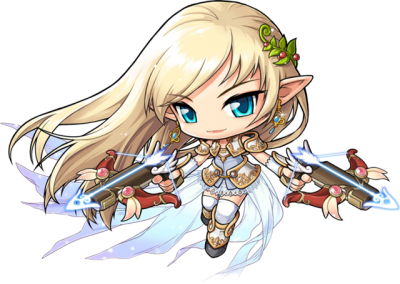 Mercedes is the third Hero class that was introduced to Maplestory within the second addition of the Legend Update. Just like Aran and Evan's and his dragon Mir's predecessor, Afrien with his rider Freed, Mercedes was one of the heroes that fought against the Black Mage, along with Aran, Afrien with his rider Freed, and 2 others until she was frozen for decades to come. Mercedes is derived from the elf race, residing in the town of Elluel, which also was affected by the powers of the Black Mage. Mercedes' main weapon of choices are Dual Bowguns, automatic portable crossbows that fires powerful Magic Arrows. Mercedes frozen by the Black Mage's curse. The storyline starts off with Mercedes waking up to see her fallen friend Afrien along with Freud. Afrien notifies her that his master had sacfriced his own life in protecting the Onyx Dragon from the Black Magician's curse. He also explained that he has also left behind an egg (which contains Mir) to be opened by a successor (Evan). Afrien sends Mercedes back to Elluel to protect her people from the Black Mage, in which she performs emergency precautions to prevent the curse from spreading. Her actions worked to no avail as the townspeople were eventually frozen and eventually, her as well. only to see that she was too late to help as the curse froze everyone in the town. Mercedes reuniting with her old friend Athena Pierce. A century has passed and the frozen heroine was reanimated from her slumber, but had left her weaker as a result. Now Mercedes must restore and protect her hometown and resume her duty to protect Maple World. Mercedes, along with the Demon Slayer are the first classes in Maplestory to start at level 10 instead of 1. Mercedes have several traits that sets her apart from the other Bowmen. Other than having a unique weapon of their own, Mercedes is not only specialized in ranged attacks, but in melee also, having several attacks that can damage the enemies up close. She does not use any arrows at all, instead she uses her own type of arrows known as Magic Arrows. Magic Arrows are given to players at every job advancement and they take up a slot that replaces the Shield slot. Magic Arrows do no have any stats or all and cannot use scrolls or gain potential, except the level 120 arrow. 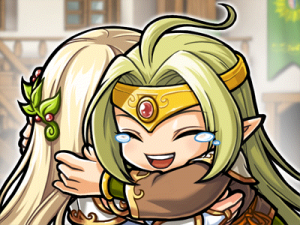 Like the Cannoneer, Mercedes possesses a link skill that allows the user to gain a 10% exp bonus. This skill can be shared to anyone of your characters once your Mercedes character is level 70 or over. Every class has their pros and cons. 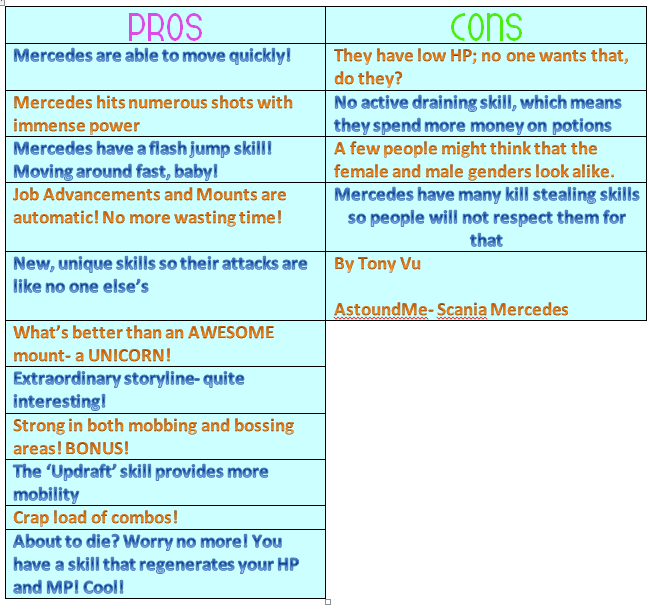 These are the pros and cons for Mercedes. Mercedes can get a mount at level 50. You have to pay 10 million mesos. At level 200, it automatically grows. Upon the release of the Tempest Patch, all secondary skills were rendered useless. Now you can just pump all your points into your Stat, DEX. Now lets get to the skills! Mercedes are known for their Combo skills, dealing monstrous damage continuously. Glide Blast + Updraft - if the timing is good. This is a mobility combo. Basically you flash jump to reach a rope and use Updraft to shoot up. Rising Rush + Parting Shot - The best Second Job combo. Rising Rush + Rolling Moonsault + Double Leaf Tornado: Great continuous combo. Unicorn Spike + Spikes Royale + Ishtar's Ring: Great Damage, there is a cool down however. Rising Rush + Rolling Moonsault + Double Leaf Tornado + Lightning Edge: Basically Lightning Edge lets you get out of there without getting hit due to iFrames. Common Question: How do I perform Double Leaf Tornado? Firstly, make sure you have booster on. Put two leaf tornadoes onto a macro. Now when you jump you can perform two leaf tornadoes. Reasoning: First few points are for easier attacking and mobility. Life is much easier with more mobility. You then max the important skills. You max swift dual shot last because your other skills will help you attack better. Second job build is based on your preference. You max everything except Piercing Storm as it gets replaced in third job. You want to max Spirit Surge and Parting Shot early. Spirit Surge first as +15% damage and +15% crit for 180 seconds. I suggest you max Physical Training before Final Attack (Mercedes) as you should be going strless or low str and you need some extra strength and dex. Ultimately, with this extra strength and Dex. you will be hitting higher. At level 70, you put one into Stunning Strikes because it will replace your Piercing Storm. At level 71, you add a few sp into a variety of skills. Ignis Roar is required for damage, avoid and crit. You then max Aerial Barrage so you can Combo. Then you max stunning strike to power up your mobbing skills. Followed by Water Shield for more protection. Then you max leaf Tornado for another powerful mobbing skill. I suggest you put Leaf Tornado on a macro. You put two on a macro. Now when you jump (with booster) you can perform a double Leaf Tornado. Next is Elemental Knight because it is a useful summon that will help you kill monsters faster. Now this is where your opinion comes in. You can decide to max Unicorn Spike or Gust Dive. I find Gust Dive to be weak and useless, so I maxed Unicorn Spike. Unicorn Spike also helps me in bossing. Anicent Warding is maxed first because it gives additional HP and % damage aswell. You then max Dual Bow Gun Expert for another substantial damage boost. After that, you max Rolling Moon Sault for a powerful mobbing skill that you can use to combo with. Then you max advance final attack for another damage boost. Now you max Defense Break for extra defense, even against Boss monsters. You have 40% to ignore all monster DEF. Now you max Ishtar's ring for some bossing since you won't be bossing much in the earlier levels. After that, you put Maple Warrior on 29 for a good stat boost, but many won't be able to afford this, so just continue onto spikes royale. Lightning Edge is maxed last since it is useless. Only useful for moving around. Mercedes soul arrows, these arrows last forever, meaning you do not have to recharge them. There are new arrows every advancement! Additionally, these arrows may be potentialed. Mercedes use dual bow guns in conjunction with a magical arrow. Description: Can only use exclusive scrolls. This part is meant to help you level up with ease! This page was last edited on 23 February 2014, at 03:20.